Migrants are coming in swarms, did you know? They are coming to Britain, as Cameron continued to explain the other week, from ‘across the Mediterranean, seeking a better life’. Outrageous, isn’t it. And, of course, completely unheard of. It’s never happened before. No, not ever in human history. People have always stayed put. … Oh, hang on, wait a moment … Of course I am being sarcastic here. Partly, I think, because sarcasm is about the only response I have left in me for the extremely worrying rhetoric politicians in the UK began using so liberally sometime last year. This is clearly a development connected to the rise of Ukip, but that is neither the only factor nor a good explanation – let alone justification. 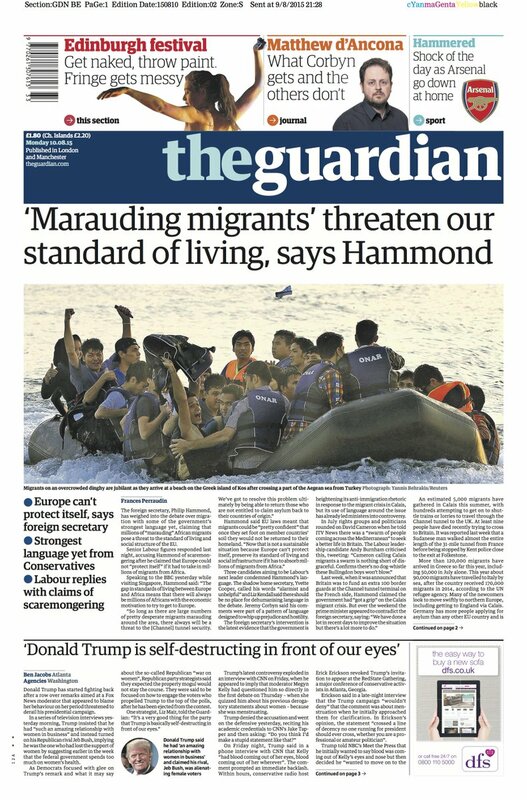 The bottom line is: the type of language that Cameron used to refer to refugees would have been considered entirely unacceptable a few years ago. For sure, there was criticism this time too, but it was quite mute, really, more mute than I think it would have been a few years ago. One reason for the absence of more vocal critcism is that people are increasingly getting used to such language: what was deemed outrageous two, three years back has gone mainstream, is being normalized. One finds it in newspapers, hears it on the radio and, on occasion – as we now know – encounters such language on TV and coming from the PM. This post is not, per se, a political piece, but let’s just be clear: it is neither refugees nor migrants who threaten the social fabric of Britain, its welfare system or employment opportunities. It is the massive cuts pushed through by the current government; it is the undermining of the NHS; it is the privatization of services currently provided by the state; it is the lack of opportunities for young people; it is the widening of the gap between classes, the haves and have nots; it is the casting out – and shaming – of the poor and vulnerable. It is these developments that are the root problem. The key point is this: it is at times like this, when a small elite, most of whom are from a wealthy background, seek to redefine the very meaning of the state and its role, that a strategy to divert attention from that agenda comes in quite handy: and that strategy is the casting of groups of people as ‘the other’ – essentially an ‘enemy’ – against which one’s own group can define itself. There is a long tradition of the use of ‘the other’ in this way, see for instance the discussion in Colley’s Britons (though it is by no means something that only happens here in the UK). For the idea of ‘the other’ to work particuarly well there is another trick: the dehumanisation of that ‘other’ – in our case the dehumanisation of migrants and refugees. Calling them a ‘swarm’, referring to them in plural terms only, without names – it is this language and linguistic behaviour that dehumanises migrants and refugees. Critically, it is a language that is not too far away from that employed by Katie Hopkins or that used by the Nazis. The latter defined those who, in their view, were lower human beings – well, in fact not as humans at all: it was the very point to class allegedly inferior groups of people in terms that denied them that basic humanity. The Nazis were by no means alone in doing so – a more recent example comes from the Rwandan genocide. But let me end here: this piece is not really about Cameron’s language, politicians or the media. It is about British migration history, specifically the country’s long tradition of out-migration. And, hence, it is about a significant level of hypocrisy and ignorance. That hypocrisy stems chiefly from one fact: that many people in Britain today are making a case against migrants when many of their ancestors – and many of their family and friends in the present-day – happily avail themselves of the opportunities of free movement in Europe, or seize them further afield. This hypocrisy sometimes is the result of ignorance, as the public in general is fairly ignorant of British migration history, ignorant of the bigger picture of the present-day migration of British people. Let me be clear: neither hypocrisy nor ignorance are, in many cases, deliberate or in any way malicious. They are largely the result of a lack of knowledge: British migration history and the contemporary dimensions of the present-day global movements of British people are not exactly at the forefront of teaching or public engagment. The resulting void is filled, far too often, by the reports prevalent in many sections of the media that play to populist stereotypes, reports that use the kind of language we have seen above. There is little or no corrective to this, not least because of the absence of a proper forum open to the public – a migration museum, for example, that actively engages people of all ages and backgrounds with the history of movement both from and to the British Isles. Let’s just look at a few figures. Between 1825 and 1938 alone, an estimated 2.33 million Scots made their way across the Atlantic or to the Antipodes. Their wanderlust was noted. As an editorial in Chambers’s Edinburgh Journal, observed in 1849, ‘Scotsmen are proverbially inclined to roam abroad in quest of fortune. This is true not less of the humble than of the higher ranks’. In terms of overall numbers, unsurprisingly in light of population ratios in Britain itself, the English went overseas in even larger numbers. They were, for example, the largest immigrant group in the American colonies in the 17th century and made up 80% of the 2,760,360 people (of specified national origins) who left Britain for the United States between 1820 and 1910. These migrants were not cast as swarms. They were opportunity-seekers. They were people who left their homes for fear of persecution and the desire to freely express their religion. They went because they could not make ends meet at home. They decided to leave because they felt a life overseas would enable them to better their situation. They went just for the fun of it. The went although they did not want to, as indentured labourers or convicts. They were, as Harper noted, a mix of adventurers and exiles – a mix of all kinds of people from all kinds of backgrounds from all over the British Isles. That Britain has no migration museum that explores the story of these migrants, the places they settled and their impact there – as well as that of those who have made Britain their home, how they have contributed so much to the making of this country and continue to do so – is a shame and a real problem. There were people from the city like the family of John Jack. In late October 1883, the family, John, Helen, and their two sons John Hill Hunter and James Whitson, left their home in Edinburgh for the port of Leith. Their luggage had already been packed and was delivered, ahead of the family, to the SS Iona anchored in Leith harbour, the vessel which was to take them to London. From there, the Jacks embarked on a three-month journey to New Zealand. Thanks to connections and letters of introduction, the Jacks were able to settle in New Zealand without much hardship – still John wanted to be buried in the family plot in Dundee when he died, hence becoming the first person in New Zealand to be cremated, so that his ashes could be sent back to Scotland. There were the sojourners to the Far East who returned after a few years – they were nabobs: people who went abroad – specifically India and the Far East more broadly – temporarily for primarily one purpose: that of making money. They were Europeans who sought to make profits in the Far East ‘by any legal and, if necessary, dubious means’, as Mackillop has noted. The group of Scottish nabobs included many an illutrious character, such as Sir Hector Munro of Novar, an officer of the East India Company made famous by his role in the British annexation of Bengal. Later on in the 19th century, we find William Jardine and James Matheson who, through Jardine Matheson & Co., built a trading empire that brought them great wealth – but it was one that rested, at least initially, largely on the revenue derived from the opium trade. There were those attracted by the lure of gold, such as Thomas Haig, the father of the perfect associationalist Archie Haig. Thomas was born at Pavillion Estate near Melrose in Roxburghshire on 31 July 1837. After his education in Melrose, he became an apprentice at Herbertson & Son in Galashiels, moving on to London in 1861 to work for George Trollope & Sons, builders and cabinet-makers. Yet Thomas did not last long in the metropole of Empire: having decided, as is noted in his obituary, to join his brother and sister in Otago, New Zealand, Thomas arrived in Dunedin in early July 1863. He initially engaged in gold-digging, and, given the timing of his arrival, it is possible that the discovery of gold in Otago, next to kinship ties, provided a key pull-factor for Thomas to come to New Zealand in the first place. He had little luck digging for the precious metal, however, and soon made his way to New Zealand’s North Island, settling in New Plymouth. Eventually many of the Haig family settled in Australia. There were young women for whom the work as a domestic servant offered a route overseas. In fact, this was by far the most common occupation among single Scottish female migrants was. Enticed by the prospect of greater opportunities than in Scotland, for many of these women emigration was made feasible by the availability of heavily subsidised or loaned fares that were being off ered by recruiting agencies, emigration societies and employers themselves. One of the most active female emigration agencies in Scotland was the Aberdeen Ladies’ Union, which oversaw the emigration of 330 women between 1883 and 1914. In return for the passage out the women had to work for a designated period of time (an arrangement not dissimilar to that of indentured servitude), or until they had paid off the value of their fare. There were those who wanted to reunite with loved ones like Gabriel R. Gibson of Kilsyth – a small town halfway between Stirling and Glasgow – and Myrtle MacIntyre. Their story made headlines in the San Francisco Call in 1909. Gibson had fallen in love with MacIntyre and ‘wooed his sweetheart’1 during his school days in Kilsyth. But, in 1903, Gibson left for the United States, seeking to make a better life for himself in Berkeley, California. His departure from Scotland did not put an end, however, to his love for Myrtle: the two kept in touch, corresponding regularly by sending many a letter across the Atlantic Ocean. But ‘[s]ix years of correspondence’ eventually ‘proved unsatisfactory to Gabriel . . . and he left for his native land . . . to wed Miss Myrtle MacInyre, the woman of his choice.’ Together the newly-wed couple then made home in Piedmont, California. There were also unwilling migrants like the soldiers taken captive in the aftermath of the Battle of Dunbar in 1650. Initially they were marched south, away from Scotland – this was a march on which many of them perished. Of the survivors, the majority were then transported to English colonies in America and the Caribbean. Of those Scottish prisoners who were transported on the Unity, a little over 60 were bought to work at the ironworks at Lynn, Massachusetts, with the remainder being sent to different towns elsewhere in Massachusetts, Maine and New Hampshire. And so there were all types of people of all ages, from all spheres of life and every corner of the UK. They have migrated overseas for centuries and continue to do so to this day. Historically, a good number of these people did not succeed in bettering their lives abroad. At least not initially. Many required support – this often being provided, in the absence of state-funded structures, by ethnic associations (the main subject of my work). A good number of migrants also returned home to the UK. On their journey abroad migrants took with them their culture and traditions, shaped new societies by drawing on them, building places of worship – the kinds of things that many in the UK today are so critical of when new arrivals pursue them. But what we must remember first and foremost is that many of these 18th and 18th century migrants from the British Isles went to reside in places and on land that was not theirs. They took it – sometimes with treaties and through land purchase agreements, but also, and not infrequently, by force. In doing so indigenous populations were displaced, forced off the land that had been theirs for generations. In other places, such as India, a large local population suddenly found itself governed by a small number of British administrators – a group that, as we could recently see depicted quite accurately in Channel 4’s Indian Summers, retired to its elite clubs, waited upon by Indian servants, happily indulging in its colonial lifestyle. Of course this is a very potted history of British migration. It is superficial, incomplete and not fully representative of the diverse migration experiences of the people from the British Isles. It is deliberately pointed. Still, this account allows me to make my case in point: that migration is, and has long since been, at the heart of British life experiences. That people from the British Isles have been refugees and economic migrants – seekers of opportunity and betterment, but also exiles – for centuries. Why is it that refugees from war-torn Syria and other places are referred to as a swarm? And by the Prime Minister out of all people? A swarm that, as a good part of the media wishes to make us believe, invades Britain for the sole purpose of claiming benefits. Part of a swarm that so rudely disrupts the pleasure of British holidaymakers. A swarm that ‘forces’ a delay in the release of a new music album from a British pop band. Why are priorities so wrong, why is it that these refugees are lumped together in a dehumanised swarm, with many people in Britain showing no empathy or even remotest understanding for the refugees’ plight? – Because they are ‘the other’, cast as such by sections of the media and some politicians to hide the real issues Britain needs to resolve. Why is it such a problem that some of those people in Calais and elsewhere are wishing to come to Britain simply because they seek a better life? What is so wrong about economic migrants? Isn’t that exactly what many of the British people we learnt about above were? Isn’t that what many – though not all – of the British people living in continental Europe and othe parts of the world today are? Just have a quick look at programmes such as Wanted Down Under and there you have it. – But of course those people are British, and probably white. And that changes, if not everything, then certainly a lot. Or so it seems. And therefore, finally, why is it that those with a darker skin colour, those from poorer countries in Africa or eastern Europe, are immigrants (yes, that swarm of them again), while the British abroad are expats? In fact, this isn’t a British thing: as German journalist Nils Markwardt rather aptly noted recently: ‘Wenn “Wirtschaftsflüchtlinge” weiß und deutsch sind, heißen sie übrigens “Auswanderer” und haben eine eigene Show auf Vox.’ (translates to: ‘By the way, if “economic refugees” are white and German, they are called “emigrants” [a term that, in Germany, does not have a particularly negative connotation] and have their own TV show on Vox [a German TV channel that has a number of shows following the life of Germans abroad]; original tweet here). Ponder those for a moment. And please share this post. PS: I am an immigrant. Not an expat. Not someone who lives overseas temporarily. Not a German outside of the homeland or some such. I am an immigrant. And proudly so. Not least because I know that migration is a positive thing. It enriches cultures and people. Let’s talk about it in that way. Let’s show some empathy. And let’s call out loudly those who incite hatred and racism. I do not want to suggest that all is rosy and that there are no problems. But the key is this: the only way to tackle the problems that do exist is through tolerance and understanding. Not through insular and populist xenophobia.